I have a love-hate relationship with Rome, Italy. See, I lived there for 6 months in 2017. It was a joyful season of fresh spring weather, delicious and authentic food, curious sightseeing, learning the language through immersion, and plenty of walking to keep me in shape! That’s the love part. But the reality is that there were also negatives (hate is probably too strong of a word). I disliked the fact that they city was constantly dusty (you know it’s bad when every morning you blow black grime out of your nose, yuck), the roads are old and not well maintained, no one uses air conditioning, and there are a million tourists everywhere. Combine the amazing sights with loads of tourists, and I quickly discovered where the locals go. But, despite the crowds, I still have one favorite spot in Rome: the Pantheon. The Pantheon is one of the most well-preserved buildings in Rome, especially considering that it was constructed by 125AD! 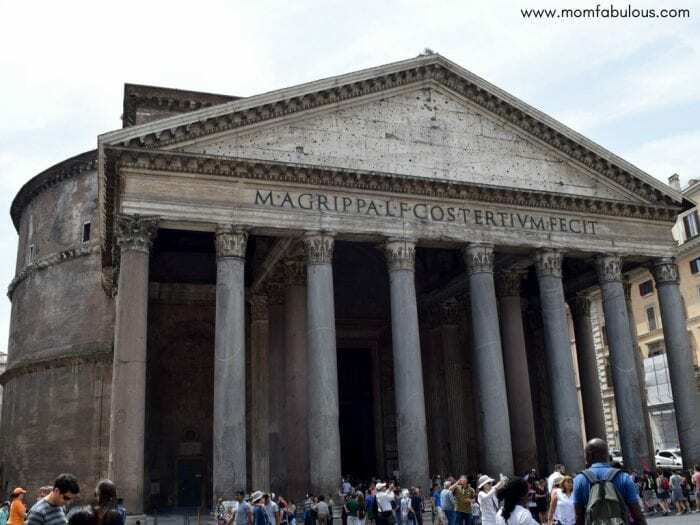 Pantheon literally translates to “many gods” and was a place where all the gods of the Roman empire were worshipped. It’s was also erected as a place for the emperor to make public appearances. The structure supposedly let the crowd know that he was of a divine nature and equal with the other gods. The outer porch is built in a traditional Greek style with massive bronze doors. Don’t be fooled; although the outside is plain and simple, the inside is a magnificent circular room measuring 140 feet wide and 140 feet tall! It’s covered with colorful marble walls and a domed ceiling. 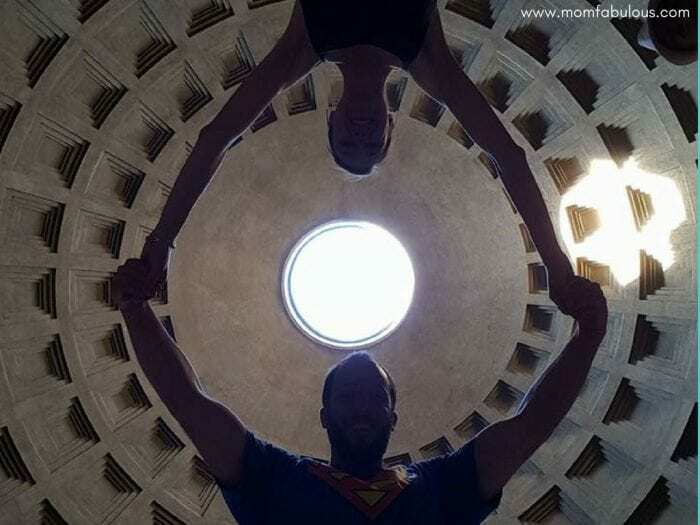 Don’t forget to take a selfie directly under the Pantheon’s dome! Take a closer look and you’ll notice that the dome isn’t completed – there is an open oculus! That 8.8 meter wide “window” is the only source of light to the enormous room. When it rains, you’ll be able to tell (which is also why there are drainage holes in the floor). 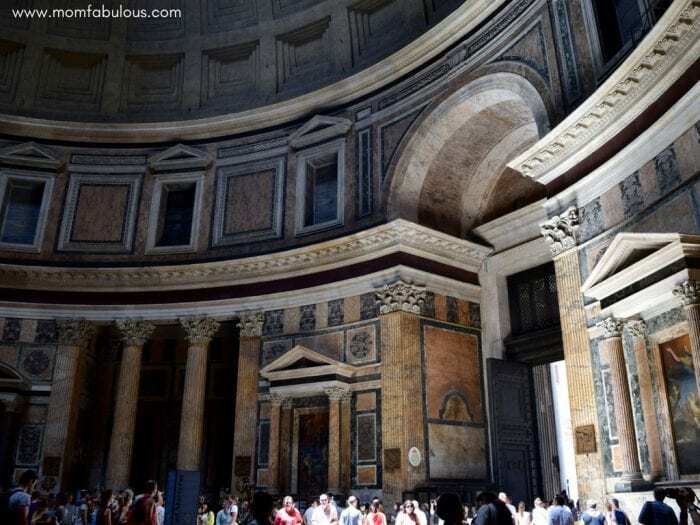 Can you tell how large and spacious the Pantheon is? Wow, those are colorful walls! 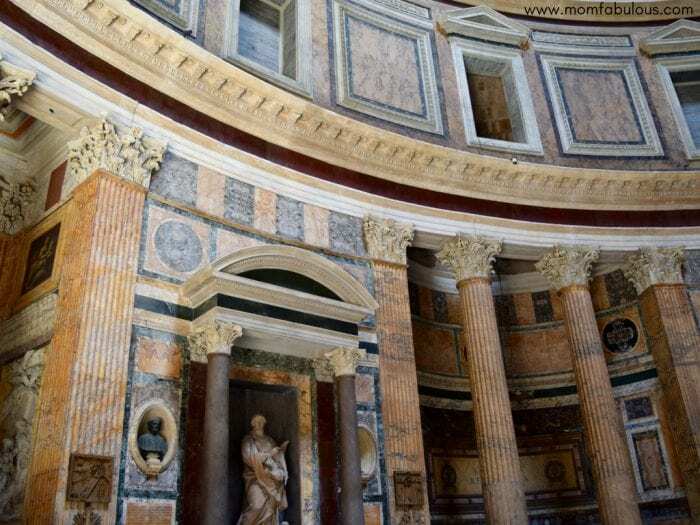 It’s worth joining the crowds of tourists to visit the Pantheon. I will always enter the throngs of tourists to visit the Pantheon. Because it’s just so beautiful. I mean, I’m standing in that spacious room and can’t fathom that it’s 2000 years old! The colors on the walls are vibrant. The well-worn floors are somehow comforting and familiar. The dome is so impressive that you’ll get a neck ache staring up at it. It’s astounding to imagine how they built such a magnificent structure 2000 years ago, before technology and heavy machinery. How has it survived so well throughout Rome’s tumultuous history? How come the inside is drastically more appealing than the outside? 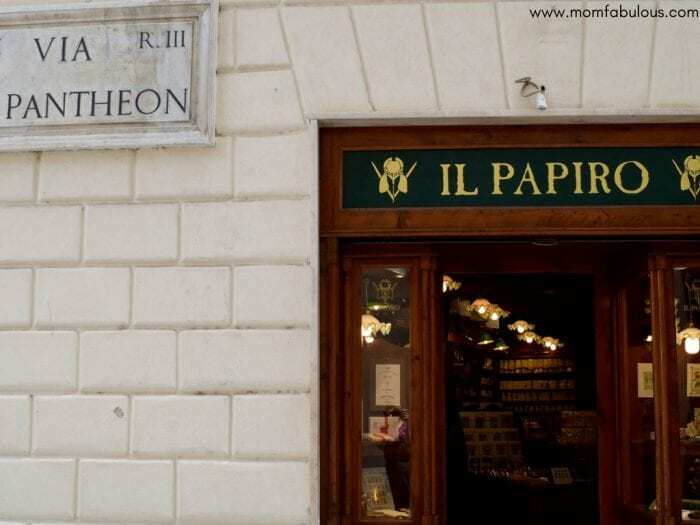 When I lived in Rome, I would often find myself near the Pantheon. And when I was near it, I had to go inside of it! I’d gaze around at the awesomeness of it and take a dozen mental photos so I would never forget it’s beauty. In case you can’t tell, the Pantheon is impressive. 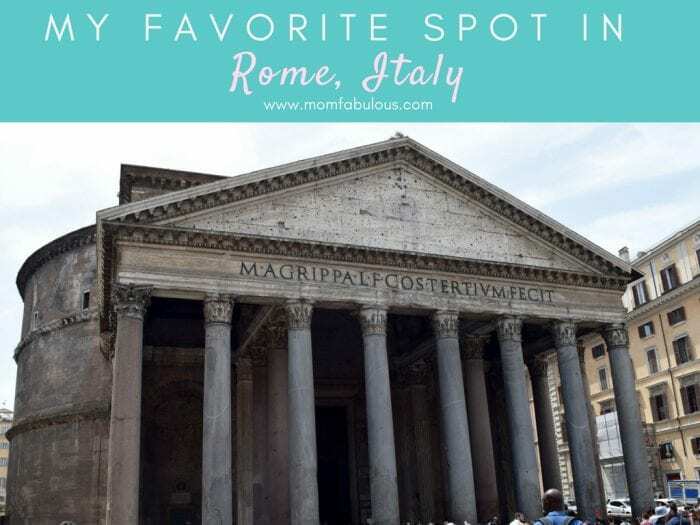 If you find yourself there for a visit, here are my recommendations of places to visit right near the Pantheon. Treat yourself to an authentic Italian espresso at this quaint cafe! 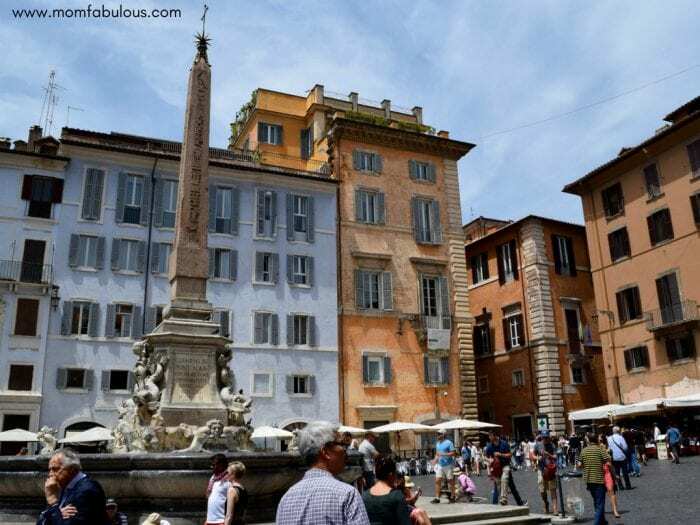 Considering that it’s only a stone’s throw away from the Pantheon, it’s actually favorite spot for locals. It’s such good coffee that my husband still orders his beans from there, even though we now live in America; we have multiple friends in the States who do the same thing! You won’t regret stopping here! Another option for coffee is La Casa Del Caffè Tazza D’oro. This traditional bar-style place delivers excellent coffee at tourist prices and with tourist lines. But if you can’t get into San’Eustachio Il Caffe, then definitely go here. I could wander this shop every week…actually, I have! It’s brimming with fancy stationery, delicate fountain pens, original gifts, Italian landmark artwork, and leather journals. The staff are extremely friendly and will help you personalize your gifts or monogram your items. You’ll be surprised at what you find in this quirky shop! You can’t leave Italy without buying something made of genuine Italian leather! I’m not a fan of purses, so leather jewelry caught my eye. This little shop has the best handmade leather bracelets, leather keyrings, other leather goods, and fountain pens. As a petite gal, I appreciate that all of the bracelets come in 3 sizes; the smallest fits my tiny wrist perfectly! 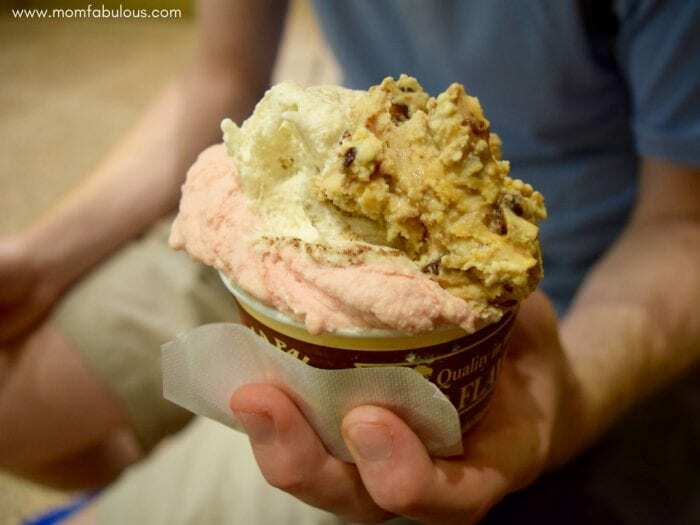 Gelato is an essential that you must include in your visit to the Pantheon. And this place offers a whopping 150 flavors! My recommendation: grab an extra large cone, plenty of napkins, and head back to Piazza in front of the Pantheon. 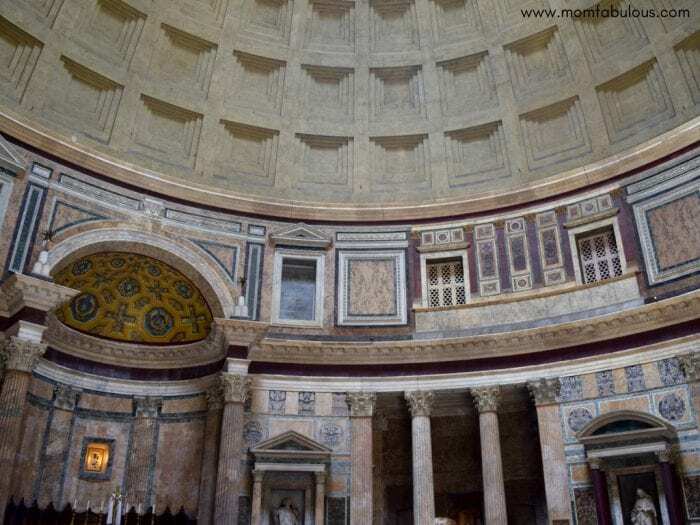 Find a spot to stand (or sit) and simply admire the Pantheon!